These stuffed cherry tomatoes are a crowd-pleaser and a vampire-pleaser with their gooey insides and red outside. Cut bacon into small pieces and fry until crisp. Place fried bacon on a plate lined with paper towels to drain and cool. Thoroughly wash tomatoes. 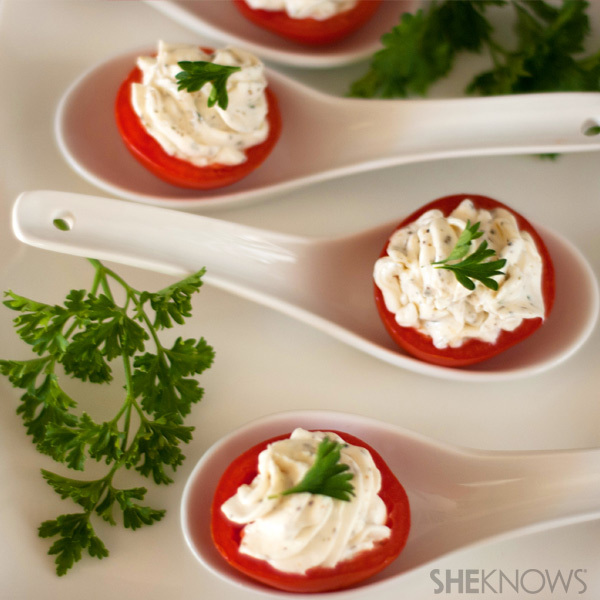 Slice tomato tops off, scoop out seeds and filling with a small spoon or melon-baller. Place tomatoes upside down on a plate lined with a paper towel to drain for 25 minutes. In a medium mixing bowl add bacon, cheese, mayonnaise and onions. Stir until well blended. Fill tomatoes with mixture and refrigerate overnight. Serve cold.